Ridge gourd (Peerkangai in Tamil) is rich in dietary fiber and is a good source of vitamins & minerals; works well for diabetes, weight loss and is an excellent blood purifier. 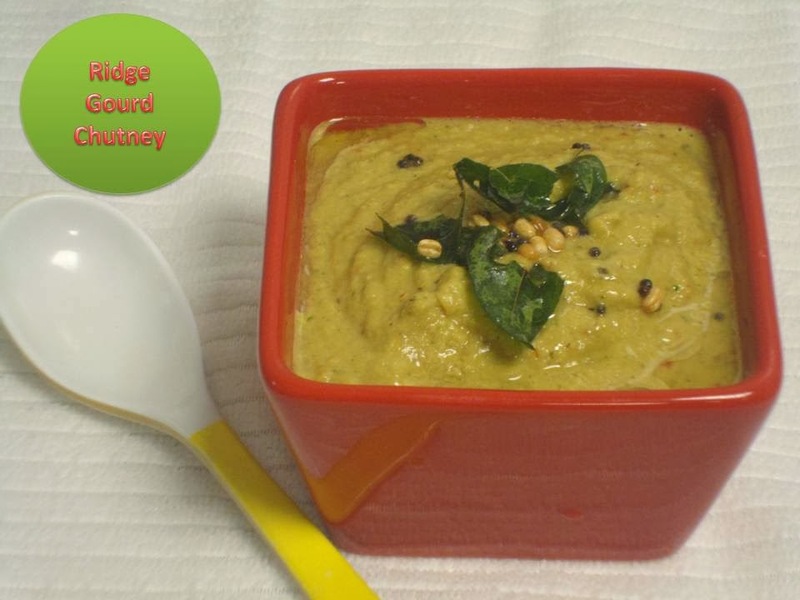 Here is a delicious, easy to make chutney that goes well with South Indian breakfast varieties, such as Idli, Dosa and Uttappam; suitable as an accompaniment for rice, as well. A smart way of adding this vegetable into the diet of your family members; they will not even recognize that there is a health friendly vegetable in this chutney! Chop the ridge gourd into bite sized pieces and keep aside. When the colour changes to golden brown; start adding red chillies, onion and tamarind one after another. Saute for few seconds. At last add corriander leaves, curry leaves and grated coconut; mix well. Take a blender or mixie add ridge gourd mixture along with water (Adjust the water quantity according to the desired consistency) and grind it into a fine paste. Add little water, if ridge gourd sticks to the pan. In our home ,i usually prepare this chutney with out coconut and onion.I add green chillies instead red one and some more coriander leaves So the output will be in plain green colour. Love that crispy dosa with ridge gourd chutney, delicious. my fav chutney.. love this combo..